Who wins when Frankenstein lumbers towards the Wolf Man? Can Godzilla crush King Kong? Could Jason meet Freddy Krueger in his dreams? There’s a logic to those crossovers, at least in that they mirror tonally and court similar audiences. But then there’s the weirder ones: Abbott and Costello meeting Dr. Jekyll and Mr. Hyde, for example. What makes them work? Do they work? And, perhaps most intriguingly, what are you losing in that crossover process? 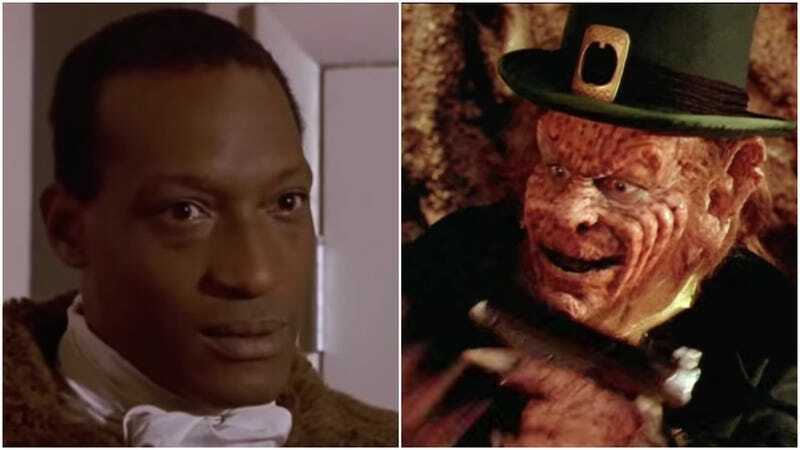 Plenty of insane crossovers have almost happened over the years—Pinhead vs. Michael Myers, for example—but none boggle the mind so much as a proposed film that would’ve pit Tony Todd’s mythic Candyman against Warwick Davis’ cackling Leprechaun. Todd’s remarked on the potential project—a possibility due to the properties being held by the same studio—a number of times over the years, including in a new interview with Dread Central that finds him again taking credit for squashing the thing. Todd’s quote is striking, if only because, well, nearly no horror icons are treated with respect, at least not in the long run. Just about every major horror figure has been corrupted, compromised, or otherwise defanged, not just by crossovers, but also by studios trying to jam these monsters, cynically and often uncomfortably, into the cinematic trends of the moment. Thanks to Todd, that never happened with Candyman. The sequels were shaky, sure, but the actor made pains to craft a monster that never betrayed his own tragic backstory, even if, as tends to happen with Todd, it meant occasionally veering into portentousness. Through it all, though Candyman always felt like a character, not just a killer. As such, Jordan Peele’s upcoming reboot has a helluva lot less character rehabilitation on its hands. That sets it in stark contrast with David Gordon Green’s recent Halloween reboot, which is notable for having sought to strip away the convoluted storytelling and lame gimmicks of the latter-day sequels and focus instead on the unknowingness that made Michael Myers “The Shape.” Did it succeed? We didn’t think so, but it was nevertheless a valiant effort to restore a once-feared figure to their former glory. And that trend’s likely to continue as Jason Voorhees and Freddy Krueger both prepare to (again) be resurrected. The Candyman series isn’t perfect, but at least we never had to see Todd stand knee-to-hat with the Leprechaun, the former’s meandering drone clashing against the latter’s braindead one-liners. Let us offer thanks for such small favors by revisiting the most humiliating moments of a few our favorite movie monsters (and, of course, the Leprechaun). Remember when Freddy discovered Nintendo and Breckin Meyer hopped around like a comatose Mario? Hellraiser: Revelations. All of it. Death to fake Pinheads. Never should’ve left Crystal Lake. Just because Leprechaun is nobody’s favorite movie monster doesn’t mean you shouldn’t watch him kill a Starship Troopers extra with a lightsaber.